Unfortunately the "Back-to-School Treats Cash Back Giveaway" offer is no longer available. TopCashBack.com is one of the world's most generous cash back websites. They pass at least 100% of the commission rate that stores pay - to advertise their products and services - back to their members. TopCashBack also provides members with discount coupons to be used in conjunction with cash back for even more value. By making TopCashBack.com your first visit when you consider buying anything online, you will be able to earn cash back on over 3,500 brands including Amazon, Walmart, Macy's, and eBay. TopCashBack is free and simple to use. When you shop through them, they'll pay 100% of the commission rate that retailers pay them - to advertise their products and services - back to you as cash back. Visit their website today to start earning maximum cash back with TopCashBack. From now until September 12th, 2016, they're hosting the Student Treats Cash Back Giveaway. 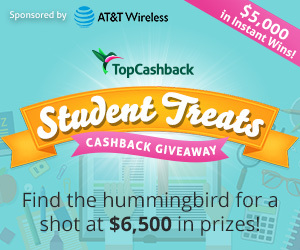 Start by registering with TopCashBack and logging into your account to look for clues that lead to hummingbirds. Collect hummingbirds by clicking on them. Each one may contain an instant back-to-school treat from $0.25 to $100 and each one counts towards your hummingbird total, a minimum number of which will be worth a prize, too. The grand prize of a Lenovo laptop, $500 in AT&T Wireless gift cards, Beats by Dre headphones, and a backpack full of goodies is valued at $1,500. Play now as a new or returning TopCashBack member. You'll be able to see a roundup of daily clues through the link below.